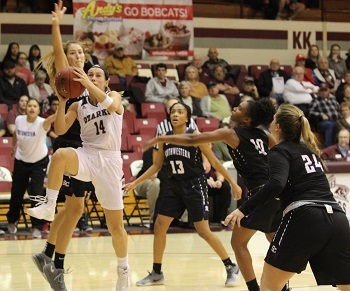 College of the Ozarks Lady Bobcat basketball doubled up Southwestern College (Kan.) on Friday evening, as they defeated the Lady Builders, 88-44. 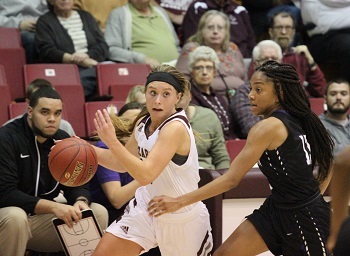 The Lady Cats vaulted to a first-quarter 15-3 lead before Southwestern realized what hit them. 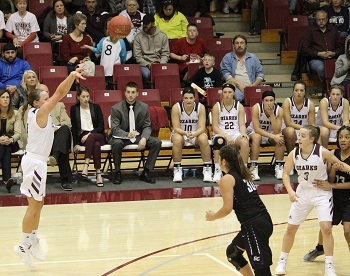 Although CofO didn’t have their best shooting on hand in the first quarter (33.3%), their defense held the Lady Builders to single digits, closing out the quarter at 22-9. The second period saw the Lady Cats improve their shooting (43.2%), as they scored 30 points and allowed only 7, taking a 52-16 lead into the locker room at halftime. Cass Johnson led the Lady Cats at the half with 15 points, going 5-of-8 from beyond the three-point line. Madi Brethower scored 11, and Kelsie Cleeton led the team with 9 rebounds while also scoring 8 points. Southwestern made some adjustments at the half, producing even scoring at 9-9 through the middle of the third quarter. Once again, however, the Cats began to pull away, leading 74-32 after three quarters. In the final quarter, with all starters resting on the bench with more than six minutes to play, the Lady Cats cruised to an 88-44 victory. Newcomers Clare Shetley (Bourbon, Mo,) and Hannah Pfeifer (Mountain Home, Ark.) made their collegiate debut in Friday’s game. Pfeifer put six points on the board, and Shetley scored three. Leading the Lady Cats were Cass Johnson with 23 points, going 7-11 from beyond the arc, and Kelsie Cleeton, who posted a triple-double of points (10), rebounds (15), and assists (12). Senior Madi Brethower had a solid game, tallying 15 points alongside 7 rebounds. Also scoring in double figures was sophomore Grace Steiger with 10 points. All Lady Cats scored in the game. 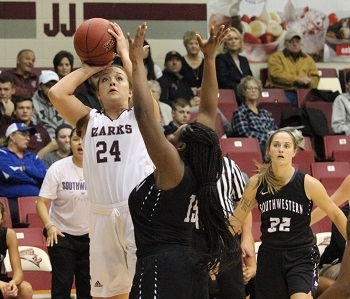 The Lady Builders were led by Marissa Evans and Ashley Carrillo, who scored 12 points apiece. Carillo also led her team in rebounds with 9. The win takes the Lady Bobcats’ record to 2-0 on the early season. The Cats will head on the road for four games over the next couple of weeks before returning home to host the Coke Classic on November 16-17.